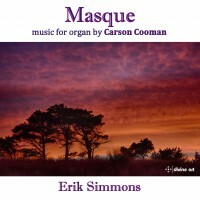 Symphony for Organ (2013) was written for and is dedicated to Erik Simmons, whose enthusiasm for my organ music brought about a renewed period of creativity. The overall symphony is cast as a dramatic progression from darkness into light. The first movement, Masque, is extremely violent and bleak. The title is used with a touch of irony—for this is not a masque of courtly diversion, but rather a furious struggle against the darkness, played out in a series of dramatic episodes following a Tudor-era formal design. The ending builds to a dramatic peak, and leaves us in shell-shocked silence. The second movement, Sarabande, begins quietly and mournfully, and gradually gains in fervency. A faster middle section is a spinning dance before the return of the opening music. In the coda, the light gradually approaches. The third movement, Chorale, evokes the colors of a new dawn. The music of the first movement’s struggle gradually becomes washed in the blaze of morning. Though I did have a specific impetus in mind while composing, it seems best not to divulge it, so as to allow the listener to hear the symphony in a more universal manner. For indeed the existence of darkness and the desire and hope for light are ubiquitous and eternal.